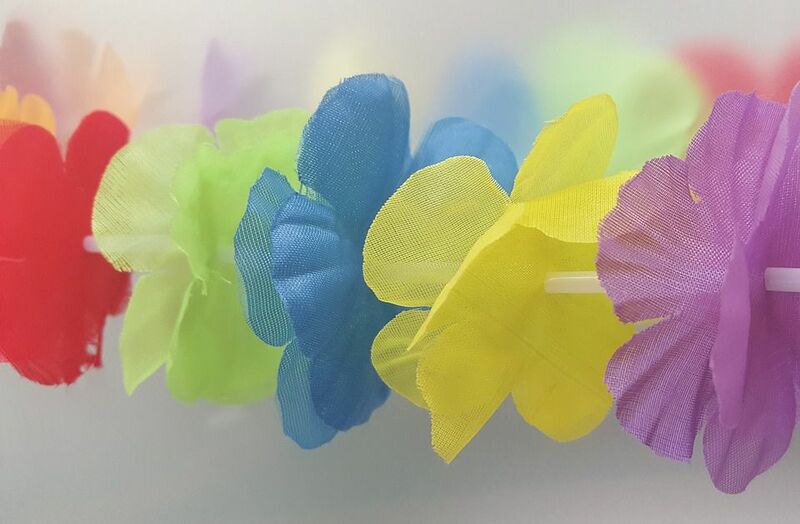 Get those grass skirts moving with these fun and active luau party games for kids. Divide players into two teams. Have them form a line by holding hands. Hand the first player in each line a hula hoop. The hula hoop must be passed from the first person in line to the last person in line without anyone unlinking their hands. Kids will need to step into and out of the hoop, while still holding hands, to move it along. The first team to get their hula hoop all the way across the line wins. Hide some luau-themed items around the party area. Give kids a list of the hidden items and send them on a scavenger hunt to find them. Put a luau twist on the classic outdoor game of ring toss. To play, stake short Tiki torches in the ground (unlit, of course). Have kids stand a few feet away and toss hula hoops to try to get them to encircle the torches. Have the children sit on the ground in a circle. Give them a coconut to pass around as Hawaiian music plays. When the music stops, the child caught holding the coconut is out of the game. Play continues until only one player is left. Because this game is most often played with small children, you can give each player a trinket prize as he is counted out of the game. Set up a craft station where kids can make their own Tiki puppets out of brown paper bags. Have a number of plain, brown paper bags and an assortment of pre-cut craft foam, colored paper, colored feathers, and other accessories that can be glued to the bags to create facial features, hair, and face paint. Fill two beach pails with sand. Place a shovel in each pail of sand, and place them at one end of the luau party space. Create two teams and have them line up behind a starting line several feet away. Give each team an empty beach pail identical to the one filled with sand. On the command “go!” kids will begin racing, relay style, to carry a shovel of sand from the full pail and dump it into the empty pail. They must try their best to spill as little sand as possible because when the race is over, the team that has added the most sand to their previously empty bucket wins the game. Hang a hula hoop from a tree or someplace where it can be suspended slightly above the ground. Give each player a pair of flip-flops to wear. Kids will line up and take turns kicking the flip-flops off their feet, attempting to send them flying through the hoop. Score points for players whose flip-flops fly through the hoop. Separate guests into two teams. Give each team three skewers, a bowl, and a spoon. Set the skewers and bowl aside on a table, and have kids line up for a relay race. Several feet away from the starting place, set out two bowls of fruit that has been cut into cubes. The teams will race, one member at a time, to place one of the cubes on the spoon and carry it back to dump in the bowl. The spoons are handed off to the next players who will also race to gather another piece of fruit. Once all the fruit has been carried back, kids must use it to assemble three kabobs on their skewers (leave the skewering part to the older kids, or have an adult assigned to do the skewering). The first team with three complete kabobs wins. This game is played just like musical chairs, but rather than chairs, leis are spread out on the ground. When the music stops, players must sit on the ground in the circles formed by the leis.